Volunteering for Sparrow is becoming a bit of a tradition in our family. My brother volunteered in the balmy spring months of his gap year. I decided to go later in my career, and to shiver through the depths of Jo’burg’s worst winter for many years. The question I got asked a LOT in the first few weeks of my stay were: “Is it what you expected?” Frankly, I don’t know what I expected, but by the time I left, both Sparrow and South Africa had gotten firmly under my skin, and I confess I was distinctly misty-eyed on the final journey to the airport. I can’t possibly do justice to the challenging, wonderful, frustrating and inspiring time I had over my 3 month stay in the space of a few minutes. I could tell you many moving stories about the children I worked with. I have chosen to tell you about Michael in my Maths class. Michael is a tall, rangy and very cool individual. He did not welcome my arrival and worked hard to challenge me. He got into trouble for gambling at school and was suspended as a result. He was very clearly an intelligent young man, but he was a frustrated teenager, reluctant to work and not an easy man to work with. When the time came for his end of term exam, Michael had to sit it separately from the rest of his class because of his suspension, and when I asked him if he wanted to know his score, I half expected him to shrug off the question. He did not. And when I told him that he had come top of his class – I think he got 96% – the smile that lit up his face was possibly the best moment of my entire 3 months at the school. He was proud of himself and I was positively bursting with pride in him. It is not easy being a student at Sparrow. Many of them have huge challenges in their lives and often they believe that they are stupid – after all, for years they have been struggling to manage in other schools. So the chance to learn and to succeed is of huge importance to them. Every individual I met at that school wanted to do well, however much, like Michael, they might sometimes try to hide it. And Sparrow’s support gives them a chance at doing just that. It represents a safety net for those kids who would otherwise just fall through the educational cracks. I am so grateful to have had the chance to work at Sparrow Schools. It wasn’t always easy and I am hugely indebted to the colleagues who supported me – especially Mary-Anne – and to the kids who made me laugh, who made me proud and who made it well worth getting up in the dark for another day of school.…After all, by the time they were wishing me “Good morning, ma’am!“ at half past 7, many of my students had been up for hours and travelled by multiple buses from the opposite side of Johannesburg’s sprawl. That’s a serious commitment to improving your life. In November of last year, Yvonne Mercer, the Headteacher of Haberdashers’ Aske’s Boys’ Preparatory School, and Julie Richards the Deputy Headteacher of Watford Grammar School for Girls spent 4 weeks at Sparrow Foundation School, using their considerable experience in the classroom and as managers. They supported the teachers in every aspect of their work including working on lesson plans, feeding back on their lessons and making suggestions for the future. Julie Richards who is a De Bono trainer also ran thinking skills workshops for the school staff. Following Yvonne and Julie’s visit, both their schools embarked upon fund raising which was targeted at providing vital resources (Maths and English textbooks and class readers). To date their School communities have raised more than £12,000. We thank both schools so much for their tremendous support. Alison Allberry – So What Are You Going To Do When You Retire? “I taught in a Suffolk middle school for 30 something years, starting as a French teacher and ending up as SenCo. When I decided to retire at 59, giving myself a year off for good behaviour, my response to this much asked question was either “as little as possible” or “catch up on 10 years’ housework and gardening” but sudden freedom proved to be a heady and energising experience. Travel has always been high on my agenda. The trouble is, when you can go anywhere in the world, where do you go? When you can do anything, what do you do? I also had a growing feeling that you need to justify the air-miles. Serendipity provided the perfect opportunity. My brother is involved in The Sparrow Schools Foundation, a group that raises funds and selects volunteers for a special needs school in Johannesburg. “You must go,” he said. So, ever obedient, I went. There were a couple of mental hurdles to overcome first. Johannesburg has a daunting reputation and you have to get used to the idea that your precious liberty and independence will be severely restricted. You can’t go anywhere alone, except perhaps the shopping mall. You can’t go anywhere without a car. Public transport is very limited and not safe. When I met Maria and Sue, who “vet” volunteers, I was totally reassured. Sparrow is used to volunteers and looks after them. Then there was age. A grey-haired volunteer? I went on a personal safety training day where I was surrounded by starry-eyed gap-yearers but they were charming and I was able to laugh off my anomalous position. I began to plan a 2 week holiday taking in Cape Town, game parks and the Garden Route at the end of my stay. Enthusiasm mounted. Any lingering doubts and concerns evaporated within minutes of arriving in Johannesburg. I stayed with Astrid, a teacher at the school not too removed from me in age, together with Anna, a young German volunteer. I was looked after, incredibly well fed, entertained, involved in Astrid’s life and over the 11 weeks shown the sights. I have to admit it was different being so reliant on others, but we became firm friends. I had masses of free time and did a huge amount of reading, devouring anything I could find on South Africa. I left a little less ignorant than I arrived. Sparrow Schools is an independent school and registered charity. It consists of the Foundation School for 7-14 year olds and Sparrow Combined for 14-18 year olds. There are currently some 600 pupils. I opted for the Foundation School. At first glance it looks like any typical school: substantial, buildings set in one of the more affluent suburbs, cheerful, healthy, happy kids in uniform running around laughing and chasing one another. You are immediately struck by the kids’ politeness and friendliness as they greet any passing teacher or stranger- “Good morning Maam (pronounced Mem). How are you? ” It is only when you look more closely and dig about a bit that you begin to understand what makes Sparrow a special school. It has to be said that the way I was welcomed and accepted by adults and children was of itself pretty special and I felt instantly at home. 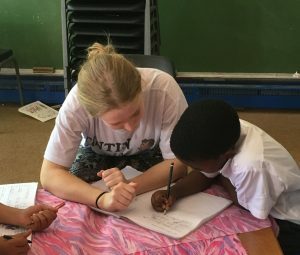 Sparrow’s mission is to cater for pupils with a range of special needs: the whole range of learning problems such as autism, a.d.h.d., sensory and physical problems, illness, educational disadvantage and behavioural problems resulting from social, economic and family problems, the legacy of Apartheid and the devastating impact of Aids. It fills a gap in state provision and many pupils arrive having run into difficulties in main-stream. Others come as a result of grand-parents’ realisation that rural education- we are talking shacks or shady trees and tribal language- has not taught their grandson to read and will not equip him for any viable future. The number coming from children’s homes has shot up to 50% in the current intake. Sparrow kids are not necessarily the poorest of the poor. Many have mobiles and money in their pockets for snacks. A few arrive in smart cars. The vast majority, however, are bussed in in “taxis” (rather dubious minibuses) from the outskirts of Jo’burg, including the infamous townships of Soweto and Alexandra, vast areas of matchbox dwellings with shanty town fringes. In many cases, economic deprivation is evident in shabby, ill-fitting uniform, lack of pens and pencils and inadequate clothing for Jo’burg’s often inclement climate. Some are malnourished. The school taps all available sources of help for the most needy. Clothing and feeding schemes are lifelines for many. 6 year old Ashley, admitted below normal school age to ease the problems of his child-led family, is thrilled to be given shoes. Mischievous Mpho, always prone to wander about, is often totally unable to focus and complains of hunger, so is sent to the cookery room for food. The name Sparrow comes from Matthew 10, “Not one of them shall fall.” The school motto is “Wings to fly,” which encapsulates the emphasis on preparation for a future. In Jo’burg this is no platitude. Unemployment in some areas runs at 40%. Without education there is little choice but to join the crowds of touts at every robot (traffic light), hang about all day at the casual labour pick-up points at the side of the road or opt, as so many are forced to, for a life of drugs and crime. The basics for a future are English, literacy, maths and job training. At the Foundation School sewing, cookery and woodwork are taught alongside the academic curriculum of English, maths and life-skills. Sadly the school was broken into and all the computers were stolen- a real blow. At Sparrow Combined the basics are furthered and pupils opt for vocational training in one of several skills: catering, car mechanics, sewing, welding, carpentry, deign and technology. Even the youngest are involved in producing jewellery and toiletries for sale. Of course education is of little use to a child whose problems prevent learning. Pupils can access a range of therapies and counselling to help them overcome speech and language, educational, behavioural and social problems and trauma. Those with the severest problems are in small special classes. It is this dual emphasis on vocational training and helping children deal with their problems that singles Sparrow out and accounts for its success in so many cases. Key to this is the extraordinary relationship between staff and pupils. Above all children are accepted for who they are, bag and baggage. When Thandile erupts because of intolerable family pressure, (he is not economically deprived but totally neglected. He regularly watches his stepfather beat up his mother and lives in terror of being beaten if he doesn’t toe the line) he can go and vent all his anger on a punch ball. When little Tabang loses it and starts throwing chairs and kicking peers and teachers he is removed with real gentleness and understanding by some year 7 boys to calm down. Teaching at Sparrow is challenging. The kids are difficult and need so much more than education. My first two weeks were spent helping with a class of 14 year olds. Most have no experience of success and are totally lacking in self-esteem. Even the oldest and most able struggle to work with any independence. The fact that they are almost all operating in a second or third language compounds the problem. The classroom echoed with cries for help and attention-“Maam, maam.” I was certainly kept busy. Stress, insecurity and a history of negative experiences also manifest themselves in disruptive behaviour; constant moving about, petty bickering, messing about, joking. After years of set 4 French and special needs English, adolescent laddishness and recalcitrance didn’t surprise me, but it was a bit of a revelation to find how open, friendly and eager to please and accept help the kids were- 30+ years in the English system has left me somewhat cynical- and how much support and encouragement even the more able needed. How many 14 year olds in England hug their teachers at the start and end of each day? Cassius and Ntombi do. My main task for the next few weeks was to administer reading and spelling tests. At least I was on home territory here. The kids quite liked it and began to ask eagerly “Have we got a test today?” I spent many hours sitting under a tree in the quad. Pity it wasn’t always hot and sunny but the kids loved being tested 1-1 and tried so hard, no matter how hard some of them struggle with basic phonics. Often I was called on to take different classes when teachers were off. I loved the tinies- in fact the head checked my pockets regularly- but my times with them only increased my admiration for their regular teacher, who always seemed to have them sitting on the carpet looking up at her adoringly with their big, brown eyes. When I took over it wasn’t quite like that. More like a seething mass of puppies, gambolling and fighting, all competing for attention. As soon as you calm one eruption another breaks out. But you can’t help smiling. Even at their naughtiest they are so endearing. Taking Year 7 was also a bit of a roller-coaster. At times it was great and the kids were amazingly bright, lively and responsive. It was humbling to watch James, who is from a children’s home and has nothing but his shabby uniform, who has eye-problems, cannot see the board and has to bend right over his book to see anything, slog away for hours on end, never taking his eyes or mind of the task. He knows what he wants: a mobile so he can keep in touch with his mother and to be a carpenter. At times it was hard. Kids fuss, give up, feel it’s all too much, too hard, too pointless. Sibongile is overwhelmed by her problems and slumps on her desk. Jolina can’t control her energy and bounces round the room or has an urgent need to leave on some pretext or other. The boys prevaricate, chuck paper, banter with one another, challenge, act hard. Aroshat taunts Thandile. Thandile lashes out. It is difficult to grasp the extent to which poverty and violence are endemic in post-Apartheid Jo’burg and a part of many kids’ daily lives. Sparrow is a refuge for a few hours a day from the pressure. You discover that every child has a story and often it’s a horror story. One 10 year old has been raped by 5 different men. The number of girls who have been physically and sexually abused is truly shocking. Ntombi came from main stream at the age of thirteen and was what can only be described as “a horrible little girl”, spiteful, vicious and thoroughly uncooperative. She was on the verge of being expelled when she was discovered in floods of tears. It emerged she was covered with wounds, the result of frequent beatings with a belt buckle from her father. Once out in the open, Ntombi’s problems were soon solved. Mother left father. A year on, Ntombi is head girl, the most beautiful, dignified, mature 14 year old I have ever met, She works incredibly hard, gently cajoles her classmates along the paths of righteousness and mothers the little ones. She is headed for main stream and success. When Jolina arrived her behaviour was equally impossible. I’ve mentioned her propensity to find any excuse not to work, to chat and wander about but how do you focus on fractions when you have been taken into a children’s home from a background of persistent abuse and have HIV? Jolina still needs a lot of support but she is cheerful, amenable and very sociable. Her grades have improved significantly and the children’s home reports a huge change in out look and behaviour. She loves to write poems. This is about her carer but to me sums up a lot about Sparrow. I can see that you do care for us. I can see that you have hope for us. To overcome the impossible and to win the possible. You encourage us to go to school, to be educated. You gave us teachers to teach us. You gave us doctors and nurses to look after us. Where our new beginning starts. You gave us child care workers to share with us the experiences of life. Without you life is impossible. With you life is a challenge, we can face it. Jolina now has hope and is headed to Sparrow Combined..
Children with physical and mental problems also thrive in the accepting, nurturing environment. Tiny Tevin has a heart problem and a brain tumour which has caused severe hearing impairment. His language and communication are severely restricted but he smiles a lot and takes you by the hand to lead you to assembly. Mark is severely autistic. At first he would just sit for hours on end combing the hair of a small doll. He had to be carried bodily to the taxi at the end of school. He still talks little, but follows routines independently and has begun to tackle basic work. He interacts happily with his peers and joined in his class’s contribution to the Christmas concert, intense concentration written all over his face but he had the song and actions down perfectly. The kids may squabble and fight at times, but they accept one another. They are colour blind. Everyone knows gangling Roston, severely autistic and unable to communicate. Everyone smiles and greets him, ignores his tics and peculiarities and guides him in the right direction. What did I get out of my time at Sparrow? It was in many ways challenging, but it was rewarding and humbling to work with kids who were so open, responsive, full of energy and cheerful despite their problems and with their amazing teachers, hard-working, underpaid but caring in the best, least sentimental way. I really felt part of the Sparrow family and was able to experience a different country in a way that is impossible as a tourist, as well as a great holiday at the end. At times South Africa’s problems seem overwhelming and one is consumed by privileged Westerner’s guilt but I was uplifted by the positive attitude I found everywhere and at Sparrow I saw the healing process at work. The term was punctuated by highlights: the opening of the Secret Garden, with the kids playing marimba and serving food, the leavers trip, prize giving, the trip to the ballet with tiny hearing-impaired Excellent totally rapt in the Nutcracker, the Christmas show, with even the least able involved, non-speakers Benezir and Roston taking centre stage as Mary and Joseph in their class’s singing tableau. If only I could have bottled the sound of the whole school singing. What did I contribute? A much harder question. I got so much more than I gave. In a small way I eased the burden on the overstretched staff and helped the school to function day to day. I taught Lushen to read his first words. Certainly my efforts were appreciated, unduly so I often felt. Of course it did help that, as an experienced teacher with some experience of Special Needs, I could take on more responsibility than a gap-year volunteer, could plan and take classes and knew about reading tests. I like to think that some of the kids will remember “Gogo” (Granny -as they christened me- I am assured it’s a term of respect!). I am already thinking about a return visit to check.